Many of the executives of B2B industrial manufacturing companies with whom I speak think of Amazon as a convenient place to have their personal assistant source a book they're thinking of having their leadership team read. That's a bit of an oversimplification...but not much. Of course everyone is aware of the retail disruption that's occurring. Many lay blame on Amazon for the accelerating pace of bankruptcies. Yet many in the industrial manufacturing world fail to consider the wide range of implications to their corporate and B2B sales strategy. Amazon is investing in equipment, facilities and technology. It's moving to control the buyer relationships and the physical movement of products. Ecommerce has triggered a "real estate boom off the beaten path" in NJ - it began with a 2013 1MM ft sq warehouse investment by Amazon. The warehouses of course take the distribution model of major small parcel carriers in a different direction. Perhaps that's why Amazon is teaming closely with USPS rather than routing everything back through a Memphis or Louisville hub? 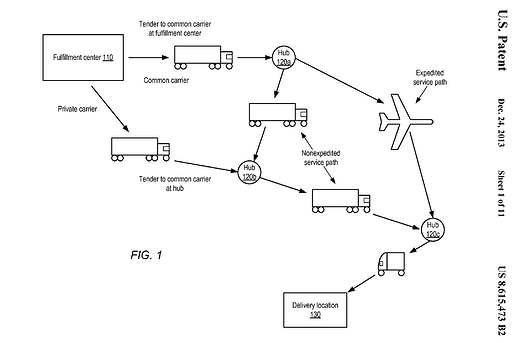 Regional staging in warehouses smooths the transition to Amazon's patented "Anticipatory Shipping" - a distribution model that knows before you do what you'll need to order. Ponder that! If Amazon becomes the got to site to find things, then search changes. Alexa is changing the nature of search - this is perhaps the most critical point for industrial manufacturers. With traditional search a typed query resulted in pages of listings. The challenge was to rank higher with organic results so that the searcher's selection of results was more likely to include yours. Then Google voice search (you probably use it on your mobile device) changed the input method from typing to voice recognition, but still provided a list of results from which you selected. A "featured snippet" might have been read back to you, but there was a list available. That completely changes when there is no visual interface - when you speak to Alexa you get an answer, NOT a list which you can peruse and select. Amazon now potentially controls the single answer....and they have a commercial interest in the outcome. The short answer is "Who knows?" How could we possibly anticipate where all this will go? That's true - but it's not an excuse for business negligence. Companies must consider implications to their sales channel model and their marketing approaches. On the one hand it seems likely anti-trust regulators will limit Amazon at some point. On the other, it's not predatory practices that are vaulting it into it's uber-buying role - rather technology and convenience. It's easier and better for us as consumers - and increasingly as a business procurement option. What kinds of planning make sense? If you sell through sales channel you need to very quickly evaluate the value of channel, refine your ideal channel partner profile and cultivate new relationships based on mutual value creation rather than a traditional transactional basis. Move very quickly to establish alternative business models in parallel. Incorporate sharing economy features (inclusive service rather than capital equipment sales - include data monitoring, technical service, alerts, reporting, continuous upgrades, suggestions for improving efficiency, etc.) that will establish your offering as far more than simply a product that can be listed and distributed. Stop reassuring yourselves that every machine is custom and every application is different. Sure, they are, but in consistent, predictable ways that will soon be engineered around. Orient your marketing around helping your customers improve their operations - forget pitching your products. That will at least establish your brand and expertise - and according to LinkedIn research often put your solution at the top of the list. That's the reality. Get used to it. You're stepping off into darkness with no clear path. You're going to have to suss it out as you go; and there will be painful mistakes. But clearly, simply plugging along pushing machine data sheets out to your reps and distributors will fail. Want to ease into it? Check out our free guide for how to merge digital marketing best practices with traditional trade shows as a place to start.